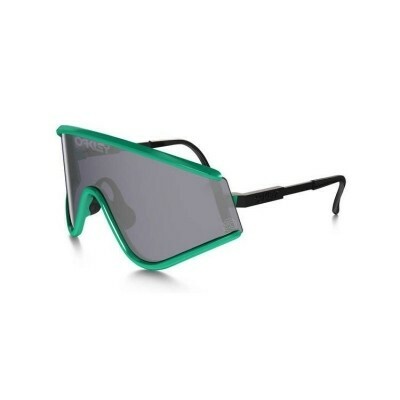 Oakley Razor Blades continued the revolution that Eyeshades began. The Heritage Collection has Razor Blades in multiple lens/frame color combinations, and each collectible comes with both straight and “trigger” shaped earstems along with a pin, sticker, guitar pick and custom Microclear bag. Topping off the trio is a lifestyle sunglass called Frogskins, our very first dual-lens design. With the Heritage Collection edition, you’ll get a collectors pin and sticker, plus a custom Microclear bag. This retro eyewear brings a slice of originality to your street look. The shape is carved right out of sunglass history, and the frame is crafted with contrast earstems that carry one of our earliest logos. To let athletes pay tribute to sport heritage while enjoying state-of-the-art technology, the collection includes renditions of RadarLock™, Radar®, Flak Jacket® XLJ, and Racing Jacket®. Our artists accented the top edge of each frame with a printed stripe graphic that carries the colors of our original eyewear creations from 30 years ago. A “30” graphic is laser etched at the corner of the lens in each edition, and as with all designs in the Heritage Collection, the custom Microclear bag is decked with art that celebrates the anniversary.